LiftMaster 3240 will flex its muscle and open and close your garage door in a jiffy or as per your requirement. Are you tired with the everyday lifting and closing of your garage door? Do you lose your sleep over the safety concerns for the garage door? Do you have shimmers when you hear an unwanted noise near the garage door in the silence of the night? Even if these are bothering you, it is time that you throw away all the quandaries and concerns involving the garage door. LiftMaster 3240 will flex its muscle and open and close your garage door in a jiffy or as per your requirement. It will also stand in cold to provide perfect safety solution to your garage door. Yes, you have guessed it correct. This is the garage door opener you were looking for. Here is a detailed of the goodies that will make you fall for it, not to mention I sure did as matter of fact. This device is one of the easiest to install. Without much complication, this can be set up without any hassle. The rail design in a single piece reduces the friction to a great extent. This accounts for a smooth functioning. The key aspect of any device is the durability and for this machine, the P3 motors enhance the durability. Moreover these motors are specialized in opening the garage doors. If you are worrying about the amount of energy required, you need not worry because this is an energy efficient device. The industrial strength screw drive provides perfect support and strength. The device is a super quiet worker. The Motor vibration Isolation system makes it a point that the device works smoothly and quietly. Every time a new code is generated at the click of the remote control which accounts for tight security associated with the device. You can also electronically monitor with the help of this device, which prevents any chance of forced opening. It is operated by a three button remote control which gives the freedom to open or close three garage doors. A multi function control panel also comes along. As the name suggests, it is a multi tasking unit. It can open or close the garage doors as well as turn on or off the opener lights from a distance. The device also has a host of additional accessories like the door and gate monitor which can close up to four gates or doors from any room of the house, the Wireless Keyless Entry System which enables your entry into the garage without the aid of either the remote or the panel. The lifetime motor warranty and one year parts warranty is the perfect icing on the cake for the users. This is definitely a device that justifies its price. Performance: With the aid of ½ Horsepower motor and the screw of industrial strength, steady performance of high caliber is ensured. The P3 motors which are specifically designed for the garage door openers furnish durability and powerful performance. Smoothness: The motor vibration isolation system ensures that it talks less and works more. In other words this device is a silent worker. It works without making and noise or sound. It is as smooth as it gets. Security: It takes complete care of the security factor. Taking help of the Security plus technology, a new code is sent every time the remote control is clicked. Compatibility: Its compatibility with the Homelink increases the number of device it can be synced with. Any vehicle equipped with HomeLink easily gets attuned with this device. Appearance: This beauty of white and grey combination will definitely cast a spell the moment you see it for the first time. The design of the product is such that lubrication can be ignored even in the extreme conditions. The adjustable light time delay confirms the energy efficiency of the product. The durability and the strength, provided by the motors make this device really special. The security technology prevents the door from closing if something is obstructing. This definitely helps in enhancing the durability of the device. The additional accessories empower the user with a lot of options. Spotless beauty exists only in the books. Well this one is almost close to being termed as spotless. There are a few niggles which might have been treated in a different manner. The accessories like the Wireless Keyless entry system and the door gate monitor are beautiful additions to the product but those come with a cost. It would have been a perfect picture if the same would have been included in the kit. The rail with this model is square which may not fit with the other LiftMaster models. These are the only ones I could figure out underlining the fact that this device is almost perfect. It is always advisable that the buttons of the remote are used with utmost care. This ensures greater durability and proper functioning of the sensors. Even though lubricating the rail is least required, but sporadic oiling of the channel will definitely enhance the satisfaction level. Given the light color of the model, maintenance of it is most important. All said and done, this product definitely deserves kudos on the technical font as well as the looks. 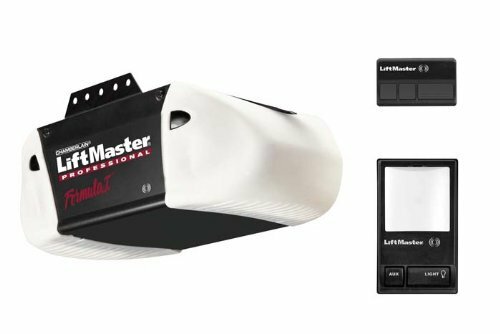 So my piece of advice to you would be, don’t wait but embrace LiftMaster 3240 for the ultimate satisfaction of using a garage door opener.